Hey all! I know, I know, it’s not even quite Valentine’s Day yet – and here I am posting a St. Patrick’s Day giveaway! Blame it on all my years working in retail, I get way ahead on holiday celebrations :) But, this is a good one, and I love entering giveaways myself, so it’s super fun to partner up to bring YOU guys chances to win too. Check it out, and if you’re feelin’ lucky, get your entries in at the end of the post. And don’t forget to sign up to get my weekly emails, for more chances to win! 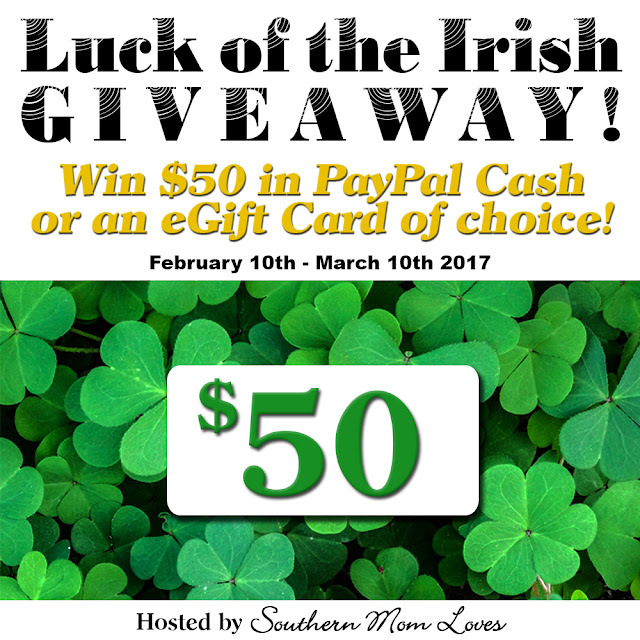 With St. Patrick’s Day coming up, Holly of Southern Mom Loves wants to show one person just how lucky they can be in her 2nd annual Luck of the Irish giveaway! So I’ve partnered with her and a handful of other rad bloggers to give you guys all a chance to win! The winner can choose from PayPal cash or an egift card. Just about any store is up for the egift card; If she can purchase it online and have it emailed to you, you can choose that store for your gift card! Amazon, Target, Sephora, Starbucks, Best Buy…which gift card will you choose? Enter through the widget below and good luck! Giveaway begins on 2/10/17 at 1:00 am CST and ends on 3/10/17 at 11:59 pm CST. Must be 18 years or older, open Worldwide (void where prohibited.) Once winners are confirmed, they will be added to the Winner’s List here. Disclaimer: The participating blogs were not compensated for this post. No purchase is necessary to enter. One entrant per household, per IP address. All entries will be verified. Void where prohibited by law. Winner will be contacted by email; Please add southernmomloves@gmail.com to your whitelist. Southern Mom Loves will be responsible for prize delivery to the winner. This giveaway is in no way administered, sponsored, endorsed by, or associated with Facebook and/or Twitter, Google, Pinterest, or any other social media platform. Over 60 New Giveaways to Enter to WIN!!! I could use a Walmart gift card. I would use it for gasoline, as well as groceries. If I won I would choose the Sephora gift card. I would choose an e gift card from Amazon if I win this! I would choose the eGift card, probably for Amazon, I always find things to shop for there. I would choose an Amazon or Walmart gift card. Have huge wish lists on both sites. I would love Amazon. I could use it on books and music. I’d love Paypal cash to use toward my next family trip! I would love to use this money to purchase some new shoes for my kids! I will choose Amazon; you can always use something from Amazon. I will choose $50 paypal as a reward and use it for a date night. I’d prefer it in Paypal cash, because then I could use it anywhere. I’m not lucky, but this would be nice lol.